Testo North America, the world's leading manufacturer of test and measurement insturments, has announced an exciting new partnership with the HVAC manufactures' representative team of The Heyden Stanely Group. They will support Testo in Texas, Louisiana, Oklahoma, and Arkansas. The Heyden Stanley Group's growing team of manufacturer representatives in the southeast adds to the strong national representation of Testo and Delivers countless years of expertise in the field. The Heyden Stanley Group is pleased to announce the addition of Jaxon Brigman to its salesforce. Jaxon brings 3 years of representative sales experience from the golf industry. He earned his Bachelor of Science in Marketing from Oklahoma State University. He also played on the OSU golf team and was a member of the '91 NCAA National Championship team. After his graduation, Jaxon played golf professionally. Both Rick and Paul are very happy with Jaxon's enthusiasm and quick product comprehension. His training is taking place in the Houston sales territory. Ricky Lamberth, V.P. 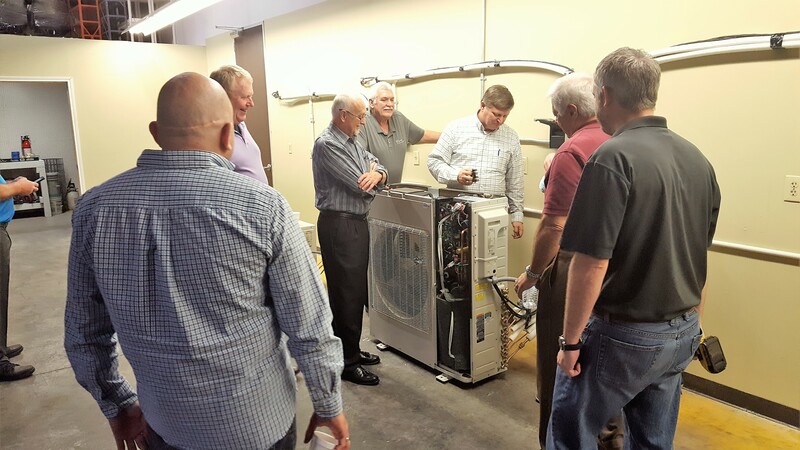 Product Development for Tradewinds Climate Systems, spends two days training The Heyden Stanley Group in The Group's new Office, Warehouse, and Contractor Traing Center. Along with Ricky Lamberth, Tradewinds' Mark Thurston, RSM, Tim McDonald, Exec VP, and Dale Keene, RSM attended. The Group really got pumped up about the Gree equipment. 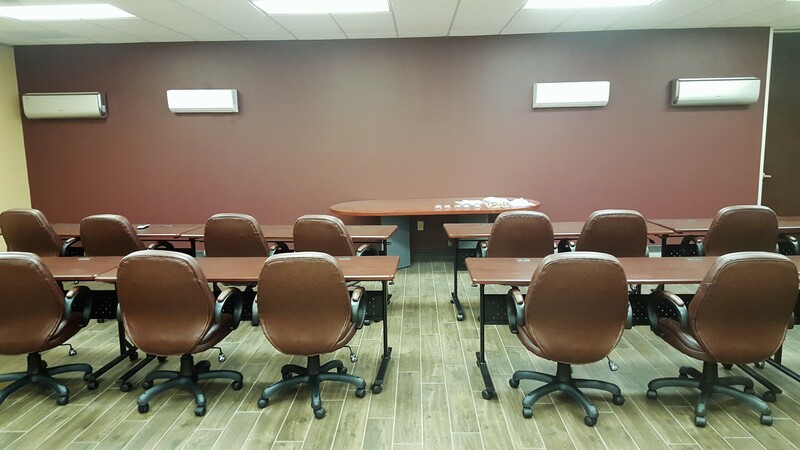 The second phase of The Heyden Stanley Group's Contractor Training Center gets completed. 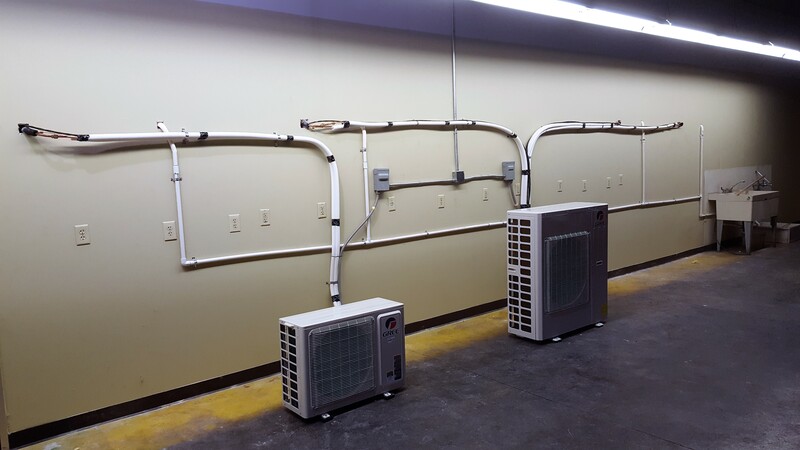 Technicians from Freedom Air installed two Gree Duct Free Systems; a Multi21+ with three different indoor high wall mounts and a Crown+ single high wall mount system. Tradewinds Climate Systems selected The Heyden Stanley Group to be their duct free system's Manufacturers' Representatives in New Mexico, Texas, Oklahoma, Arkansas and Louisiana. Tradewinds Climate Systems imports the Gree brand of DFS equipment, TTW units and packaged terminal units. Gree is the world's largest maker of DFS equipment. The Group is very happy with the equipment and with the Tradewinds Climate Systems personnel. Rick Heyden and Paul Stanley closed on a building at 7413 Railhead Lane in Houston, Texas to become the new headquarters for The Heyden Stanley Group. They plan on being in the building by September first. The Group triples their warehouse space and doubles their office space compared to the area of their Old Yale location. With the extra office space Rick and Paul are setting up a hightech training area. The Heyden Stanley Group signs on with E. James & Company, manufacturers of the high quality Powerflite V-Drive Belts. Walt Meyers, E. James & Company's National HVAC Sales Manager, met with The Group at their Houston offices. After inking the deal, Walt gave a training session covering the Powerflite V-Drive Belts. Later, he made sales calls with some of The Group introducing the line. Dean Rafiee, Director of Business Development for Elco, the San Diego, CA based importer for the very competitive high quality Thailand made Kulthorn compressors, met with The Heyden Stanley Group at their Houston offices. In Kulthorn's 35-year history, they have aquired the Sanyo compresor line, the Tecumseh, USA line and have manufactured over 40-million compressors. Mr. Rafiee hired The Group to represent them in Arkansas, Louisiana, Oklahoma and Texas. After training The Group, Rick Heyden took Dean on sales calls to introduce the line to several customes. During the Quietflex National Sales Meeting held in Key West, Florida, The Heyden Stanley Group earned Quietflex's award for higest volume sales of Quietflex's Anti-microbial Flex-duct. Paul Stanley and Rick Heyden accepted the award and bonus check from Quietflex's Presiden, Ardee Toppe. From the left; Daniel Stanley, Craigo Gaines, Paul Stanley, Rick Heyden, Ardee Toppe, and J. T. Heyden. The Heyden Stanley Group brings Ebrille insulated copper tubing rolls into its Houston warehouse. The Group intends to sell the Italian made insulated copper tubing rolls through The Group's Aircraftsmen, Inc. Currently, The Group is stocking the Ebrillsplit, the single pre-insulated ASTM B280 compliant copper tube manufactured with Ebrille's foamed polyethylene. The polyethylene is obtained by extrusion using environmentally friendly gases. The copper tube is cleaned inside and sealed at the ends under a pressure of more than 70-tons. This is an ideal product for air conditioning systems, refrigeration systems and for heat pumps. The Heyden Stanley Group celebrates its 20th Anniversary as a HVAC & R Manufacturers Representative Agency! Dave Wormmeester, Director of Sales for US*Aire, came to The Heyden Stanley Group offices in Houston and gave The Group training for the US*Aire line of grilles and registers . US*Aire is a division of Metal Industries, Inc., a 65 year old company. Metal Industries, Inc. grew to become a leading worldwide supplier of commercial air distribution products. Mr. Wormmeester hired Rick Heyden and Paul Stanley to market and sell the US*Aire line of grilles and registers in Texas, Oklahoma, Arkansas and Louisiana. The Heyden Stanley Group has worked with Dave Wormmeester previously and everybody feels quite enthusiastic about getting to work together again. That enthusiasm spread to the current US*Aire customers and to a lot of new prospects. 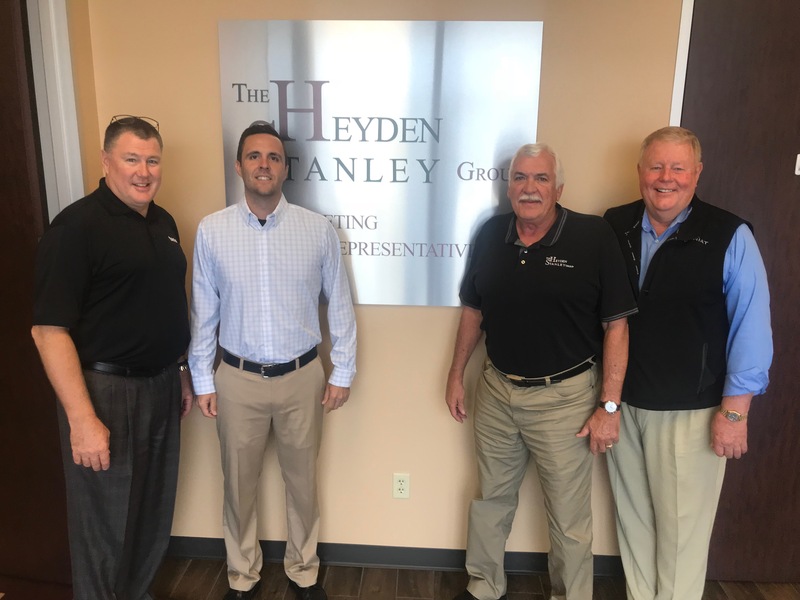 The Heyden Stanley Group brings in Danny Keating as the new Sales Associate to cover Southern Louisiana and Mississippi. Danny begins his coverage of the territory on 11-1-2010. Many know him from the HVAC Insider. Mr. Keating brings The Group vast capital of experience and knowledge. As well as working for the HVAC Insider, Danny thrived with Coburn's in the New Orleans area as their Equipment Sales Person. Also, Danny managed the whole Carrier Bock Parts Sales division in the Dallas/Fort Worth area. Rick Heyden and Paul Stanley expressed a large amount of enthusiasm over Danny Keating joining The Heyden Stanley Group. Their enthusiasm can be felt by The Group, our Manufactures and customers. After a short drive from Dallas to Ardmore, Oklahoma, Elwood Jefferson, the Regional Sales Manager for Flanders~PrecisionAire conducted a tour for The Heyden Stanley Group of the new Flanders factory and warehouse. Flanders will make the throw-away and pleated filters in this new building as well as bring in other types of filters to fully utilize the gigantic distribution center. Flanders is consolidating several facilities into this new resource to become the major force in air filtration. The moves will only provide better service to The Heyden Stanley Group's customers. Gary L. Moody begins as a new Sales Associate for The Heyden Stanley Group on January 1, 2006. Gary will work with Paul Stanley out of the DFW area. His territory includes Arkansas, Eastern Oklahoma, Eastern Texas, and selected accounts in the DFW area. Mr. Moody worked in the HVAC Wholesale business for over 29 years. Gary brings a wealth of knowledge and experience to the Heyden Stanley Group. During Gary's 20 year membership in ARWI, now HARDI, he served on the National Board and served as the National President. Also, as an active member of the North Texas ACCA, Gary was tapped for their Board of Directors. Rick Heyden and Paul Stanley expressed a lot of excitement over Gary L. Moody joining HSG. Their positive excitement can be felt throughout the Heyden Stanley Group and their vendors. A second generation steps forward as The Heyden Stanley Group improves market access 16 percent by adding a new outside salesman. 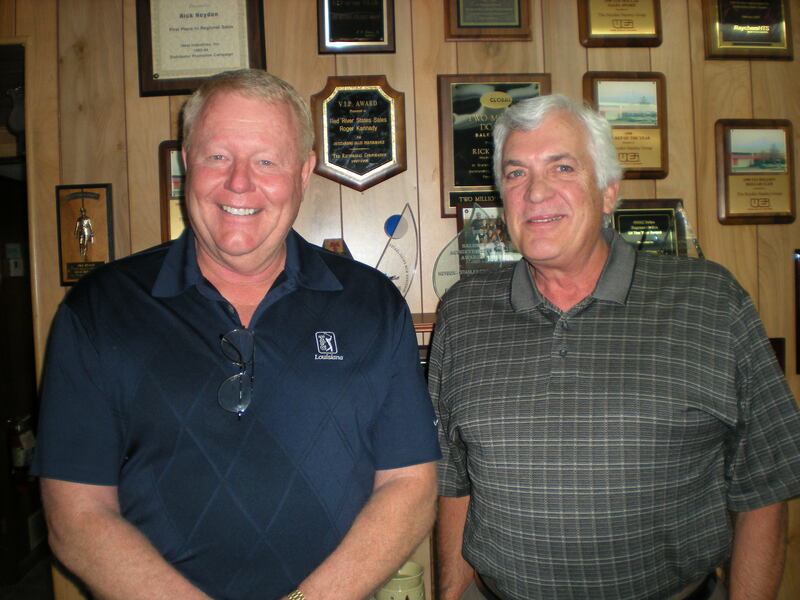 To improve market presentation Rick Heyden and Paul Stanley merged their two agencies together in 1992 to form The Heyden Stanley Group, a Manufacturers' Representative Sales Agency specializing in HVAC/R products. Seven years ago The Heyden Stanley Group bought Red River States Sales, a Houston based HVAC/R Manufacturers' Representative Sales Agency to increase their market presence. HSG grows and changes with the addition of a new generation. Today, we are pleased to announce the addition of Daniel C. Stanley to The Heyden Stanley Group. Daniel comes to HSG with a couple of years of HVAC wholesale supply experience under his belt. He will be working with his father, Paul, of the the DFW area. Eventually, Daniel's territory will include the Heart of Texas area, western Texas, some accounts in the DFW area, and the western part of Oklahoma. Paul covers those now. Along with working the DFW area and supervising Daniel in his new area, Paul supervises the sales in eastern Oklahoma, east Texas, northern Louisiana and Arkansas. Daniel joins another second generation Group member, J. T. Heyden, Rick's son, who started with HSG in March, 2003. J. T. covers Texas from Austin in the north down to the Rio Grande and from the coast at Port Lavaca, over to Del Rio. J. T. came into the group with extensive retail sales experience. Rick continues to handle the El paso and New Mexico areas as well as supervising and working with J. T. in the hill country, southern Louisiana sales, and Craigo Gaines in Houston .